Although George Polyviou Georghiou was a self- taught artist he created his own personal style, a fusion of modernist movements and the local artistic tradition. 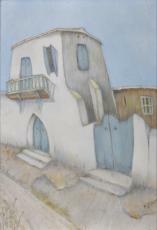 He mainly painted traditional Cypriot villagers, as he believed they were the authentic Cypriots. The portrayal of the village priest attests to the importance of the role of the clergy in Cypriot society; it also reflects the religious fervour of the Cypriot people. George Pol Georgiou was born in 1901. He studied law in London, but soon abandoned it and devoted himself to drawing. Although he was self-taught, he studied art in depth, as he spent long periods of time abroad and visited museums, galleries and exhibitions frequently. His art is characterized by a genuine inspiration and a very personal expression. He was influenced by modernist art movements, as well as by the work of older artists such as El Greco, Hieronymus Bosch and Pieter Bruegel. Georghiou also developed a close relationship with the artistic tradition of his own country: archaic sculpture, byzantine, gothic and folk art.